I divided my petit four project over 2 days, first baking the cake and filling it with jam, then letting it sit overnight before glazing the next day. While I may have only turned out 20 perfectly imperfect petit fours, I spent over 2 hours on the cutting and icing process (so I was happy to do it on a quiet morning). Maybe this provides some clues as to why it took me so long to finally try making these. I'm sure it could be done a lot quicker but, personally, there are reasons why I prefer small batch baking! The first step is making the almond sponge cake. One of my favorite ingredients, almond paste, is involved and that always promises a moist, fragrant cake. Separately whipping the egg whites and folding it into the rest of the batter helps ensure a more airy texture. I baked the batter for my half recipe in a jelly roll pan; it's slightly larger than a quarter sheet pan but if you don't have one, use a quarter sheet pan. I went with an apricot filling. I like to heat apricot preserves slightly in a pan, then press it through a sieve for a smooth jam. Slice the cake in half crosswise and spread the jam all over one half before stacking the other half of the cake on top. I covered and refrigerated the cake overnight at this point. The glaze is literally just sifted confectioners' sugar, mixed with milk for a consistency that flows but is not too thin so that it covers the cakes. To tint the glaze, literally start by dipping a toothpick or skewer into the gel paste food coloring of your choice and dabbing it into glaze to blend. Add just a tiny amount at a time if you're aiming for a soft, light shade. To keep it simple, I only tinted the glaze in pale pink but I daydream of lavender and sky blue colored petit fours. ...and I loved these imperfect petit fours. I'm really happy I gave them a go. As for the chocolate ones, I made a glaze by melting 70% dark chocolate with a tablespoon of butter and touch of corn syrup over a double boiler. I made a very small amount and had barely enough to glaze 5 petit fours but I just wanted to have a taste of them with the chocolate coating. I'm glad I did it because taste-wise, they were my favorite. My son surprisingly preferred the non-chocolate glazed ones. Frankly, he liked the sweetness and, as you can imagine, they are abundantly sweet given the generous glaze (this is where the chocolate option comes in). I think it's a bonus that these petit fours actually taste quite delicious because I never thought taste was a top priority with petit fours - admittedly, for me, their appeal was in how they looked and it almost seemed too much to ask that they also taste good. Happily, I was pleasantly surprised when they turned out tastier than I expected. Plating the completed petit fours, photographing them so I can revisit them again and again here on the blog is really neat. Petit fours are not likely something I'd make often but it's wonderful to know I can and to have a great place to start if I ever want to again. I hope to have the opportunity and motivation to make petit fours again. Until then, I'll have the sweet memories of these. For cake: Preheat oven to 350 degrees. Spray a (14 3/4 x 10 inch) jelly roll pan with baking spray, line it with parchment paper, and spray the parchment paper (alternatively, you can butter and dust the pan with flour). Sift flour, baking powder, baking soda, and salt in a bowl; set aside. Place 6 tablespoons of sugar and the almond paste into the bowl of a stand mixer fitted with a paddle attachment. Mix on medium-low speed for about 2 minutes, until mixture resembles coarse meal. On medium-high speed, add the butter and mix until pale and fluffy, about 2 more minutes. Mix in egg yolks and vanilla. Add flour mixture in 2 batches, alternating with the milk in between. Place egg whites into a separate clean bowl of a stand mixer fitted with the whisk attachment. Whip on medium-high until foamy. Gradually add the remaining 2 tablespoons sugar, beating until soft peaks form. Fold one-third of the egg whites into the batter with a rubber spatula. Gently fold in the remaining egg white mixture. Spread the batter evenly onto the prepared pan. Bake until a cake tester comes out clean, 15-20 minutes. Transfer pan to a wire rack to cool completely. Un-mold the cooled cake and remove the parchment paper. While cake is cooling, heat apricot preserves over low heat until it loosens. Press the preserves through a sieve and set aside. Slice the cake in half crosswise. Spread the apricot jam over one half and top it with the remaining half. Cover cake with plastic wrap and refrigerate cake at least 1 hour or overnight. Trim cake and cut into 1 1/2 inch squares (you should end up with 20 squares). 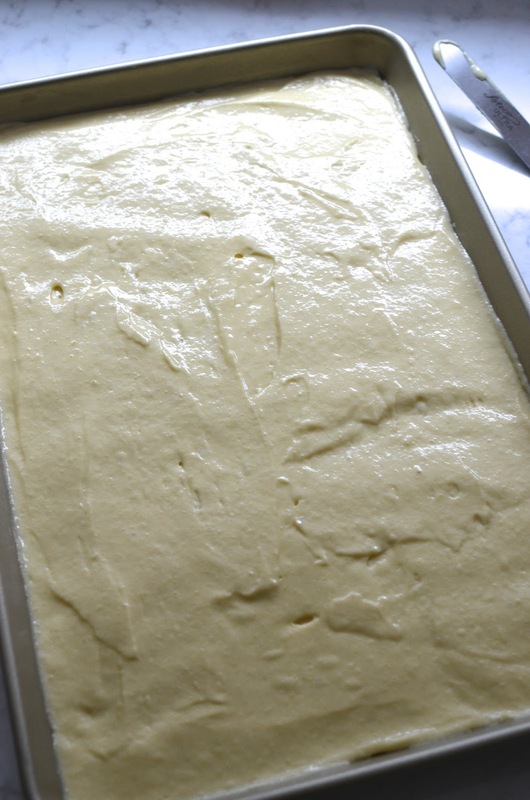 Place the cake squares onto a wire rack set over a lined rimed baking sheet. Glaze each by spooning sugar glaze over and around the petit four, topping with a garnish, if desired. Let sit until glaze is dry to the touch before serving. For sugar glaze: Place sugar into a large bowl, gradually add milk (start with half, then gradually add more), whisking until mixture is the consistency of heavy cream. You want a flowing glaze that's thick enough to cover the cakes; add more milk to thin or more sugar to thicken, as necessary. To tint the glaze, place the tip of a toothpick or skewer into the gel paste coloring and dab it into the glaze. Start with a small amount and adjust as needed for the color/shade you're looking for. Place chocolate, butter, and corn syrup into a heatproof bowl set over a pan of just simmering water. Stir until melted and smooth; stir in vanilla extract. Let cool slightly, then use to glaze petit fours. They are just too pretty to eat! The almond sponge alone is delicious enough for me, but the icing makes them so much more inviting and prettier. I agree that the almond sponge would be more than enough, taste-wise. Such fun to gild the lily. Happy blogiversary Monica! I look forward to many more years of your lovely recipes :) You and I are often on the same page and these beautiful little cakes have been on my bucket list forever. I love the pretty little foods too - and you nailed it! I'm thinking the glaze is the best idea myself. These are absolutely perfect and do pretty! Have a great week - hope you didn't get too much snow. Thank you for your kindness and sweet comments, Tricia. : ) I know your petit fours would be knock-outs. Everything you make is perfect in the best way. : ) We just got back from vacation...we loaded up on sun and it's finally warm here too. Yay! Happy blogiversary! Oh my word 7 years! That is a lot of deliciousness we have been reading. Can't wait for many more years to come. What a beautiful way to celebrate. You have gotten each slice absolutely symmetrical and so dainty. This would also be a beautiful Mother's Day dessert. These are so pretty, they look so lovely and delicate. Happy blogaversary! It's always great to try new things and what a great excuse. Thank you, Caroline. They were fun to make...finally! Happy blog anniversary! These petit fours are perfect for the occasion! Thank you! Felt great to check it off the list; we enjoyed them. Oh my goodness 7 years!! Happy Blogiversary Monica! These mini-cakes look so delight, what a beautiful way to celebrate. This is indeed a fantastic Mother's Day dessert. Lots of Love, my dear friend. P.S. I look forward to many more years of your gorgeous recipes. Thank you so much for the sweet comment. I can't believe it's been so long either! I have found so many lovely recipes and it's been a great experience learning and tasting along the way. I just saw your post today and I want to make those gorgeous yet easy parfaits. So many excellent ideas. Hope you are well! Thanks again! These look really lovely. And like you I'm always here for chocolate! Happy blogiversary! I so agree. I stopped trying to chase everything since I finally realize it's impossible to cook/bake/eat it all. I'm grateful there *is* so much for us to learn and try. Always something new waiting. Thank you! That is a big compliment! : ) As you can imagine, I adore Laduree. I have petit fours on my spring to do list too! These are absolutely stunning, and I love that they look delicious and not so 'fake' like some of the store bought cakes do...yum!! Yours will no doubt be lovely. Thank you very much, Sue.